Powerful antioxidant complex promotes cell renewal while replenishing natural moisture. 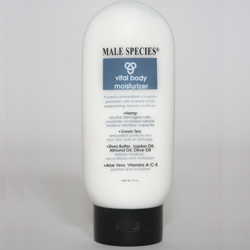 Contains Hemp which rebuilds damaged cells, nourishes and increases natural moisture retention capacity. Green Tea - an antioxidant which protects skin from free radical damage. Shea Butter, Jojoba Oil, Almond Oil, Olive Oil - restores moisture, reconditions and revitalizes. Aloe Vera, Vitamins A-C-E - soothes and nourishes.